CIDAN has been manufacturing sheet metal fabrication equipment since 1907, and they know a thing or two about innovating when it comes to thin sheet metal folding. From their unique cut-to-length lines to their proprietary folding machine that allows a single operator to easily form complex, large sections of thin metal, CIDAN equipment is precise, flexible and indispensable to businesses worldwide. Read on to see videos of CIDAN equipment in action, and to learn more about their equipment. If you have questions or would like a quote, contact us today. 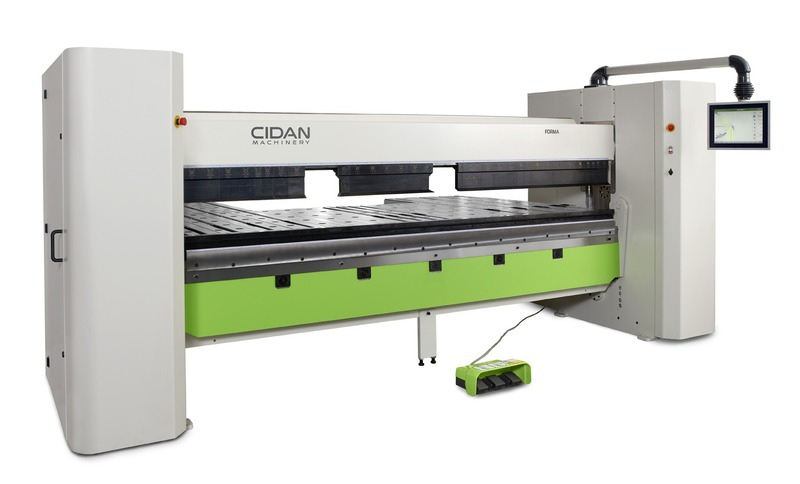 Cidan Machinery manufactures cut to length machines for lightweight sheet metal applications that are so easy to use that programming and operation can be performed by non-skilled operators. Cidan’s unique “all in one” unit has no limit on working length. It includes standard features such as an innovative straightening unit, a sheet guide for in-feed, and guillotine shear with hold down beam and double edged blades. In addition the LineLink control system and foot pedal for remote feeding comes standard with all Cidan cut to length systems. Contact us today to learn more about Cidan cut to length lines and request a quote. We look forward to hearing from you! Cidan Machinery makes unique metal folding and metal bending machines with a focus on lightweight sheet metal applications. Unlike press brakes which are best for forming smaller, hand-held parts, Cidan’s unique backguage table makes their machines best for folding larger, more complex sheet metal pieces. When the workpiece is larger or heavier than what is feasible for an operator to manage on his own, Cidan comes to the rescue with machines that allow the workpiece to rest almost entirely on the machine’s bed during forming. This means less maneuvering and lifting by the operator, faster forming of large, complicated pieces, and more efficient operation. Contact us today to request a quote on a Cidan folding machine. We look forward to hearing from you! Cidan is known as a leading manufacturer of unique machinery for lightweight sheet metal fabrication, and their line of shears is no exception. Their mission to invest in research and development results in machines that are flexible and simple to use. For a variety of light sheet applications, Cidan shearing machines cut steel, aluminum and other materials with precision and accuracy. In addition to performing high quality cuts, Cidan machines were designed to allow for a high number of cuts per minute. Best of all, Cidan machines have low maintenance and operational costs while being environmentally friendly and flexible to use in production. Their cutting lengths range from 1350 mm to 4050 mm and possess a cutting capacity of up to 4.5 mm. For a quote on a Cidan shear, contact us today. We look forward to helping you specify the best machine for your facility.